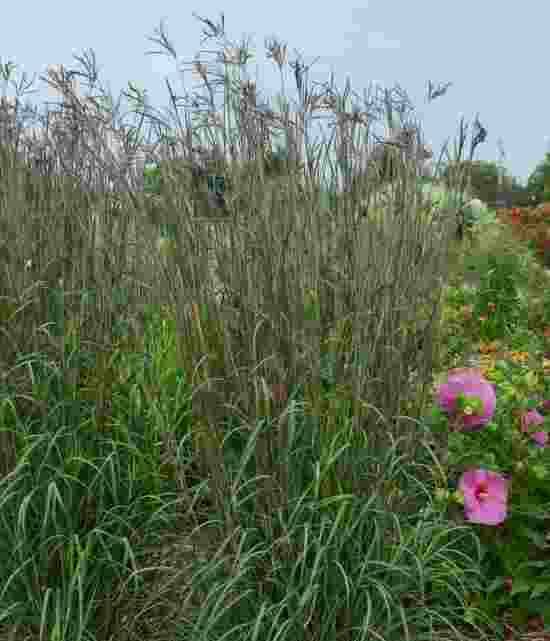 Andropogon gerardii 'Indian Warrior' is a selected form of Big Bluestem, a native North American Grasses that once was wide spread across the prairie. This tough, long lived grass forms a tall, strictly upright clump of green foliage that transitions to red then smoky purple beginning midsummer. By August the colour of this grass is really stunning. In late summer this grass sends up inflorescences on reddish stems. When the deep purple flowers first open they have hanging bright orange pollen sacs that are very visible. 'Indian Warrior' looks good as a single specimen or masses. Andropogon 'Indian Warrior' is a adaptable to most soil types. It is really easy care as long as it is situated in full sun. It will be very upright in lean soils but very fertile soils and a lot of moisture might make it a little floppy. Cut it back to 15 cms in the spring and divide in the spring.